I have always personally been an avid fan of The Body Shop products since I was in secondary school. The products have always worked for me and the prices are pretty affordable. As my skin is normal-oily combination, especially the T-zone area, The Bodyshop’s Tea Tree and Nutriganics line of products work the best for me. 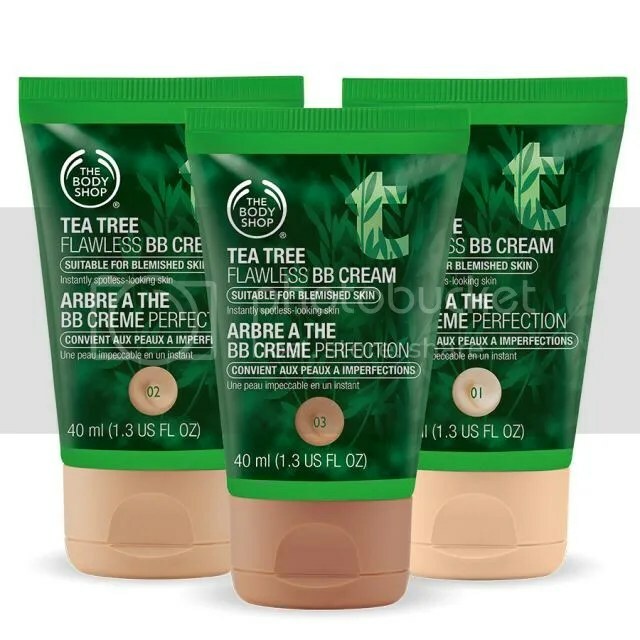 Early July, The Body Shop just released the Tea Tree BB cream and it comes in three shades: light, medium, and dark. At first I bought the darkest shade. When I swatched it in the store, it seems like it is the right fit. However when I applied it on my face it is a shade too dark. So I bought the Medium shade to mix. Now, usually I would not bother spending twice as much, but I had faith in the Tea Tree line and I have been waiting to try this BB cream for a while since I got to know of it’s launch in the UK. This product did not dissapoint me so far. The coverage is decent for a BB cream product and I absolutely love the fact that it did not slip and slide on my oily face. Of course the coverage is not comparable to full foundations and it is suitable for days when you want to give your skin a break from full-faced makeup. However it is still too early as I have not had a chance to wear it out for long. The minus points would definitely be the fact that it has such limited colour range (Light, Medium, and Dark). Also, the smell of Tea Tree is really strong in this product. I personally do not mind as I got used to the scent, but it may not exactly suit everyone’s palette. Overall, I like this product. I cannot wait to give it another go,for a longer period of time. I just hope they would come up with more shades! *products were bought with writer’s own money and opinions expressed are all from writer’s personal experience.